"After skipping for a week from the tutorial update, I am back with a bag sewing pattern and tutorial. 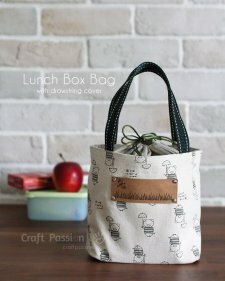 Here it is, lunch box bag with drawstring cover. The drawstring cover acts as the bag closure and will prevent the contents from falling out. The drawstring makes the lunch bag easy to open and close too. In additional, pay attention to the base of the bag, it is not the normal rectangle base, you will see it in the tutorial page. 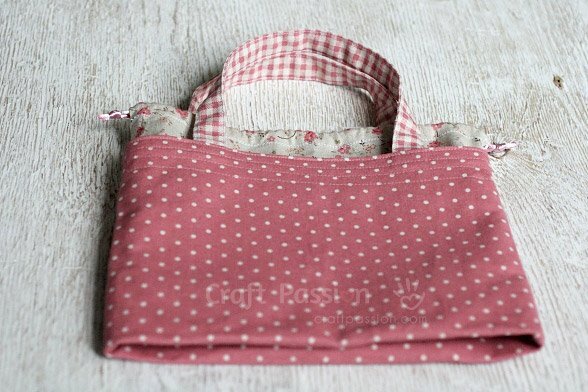 You may add a insulated lining to make a thermal lunch box bag. The bag lays flat when not in use so it won’t take up much space for storage. "Even though I categorized it as lunch box bag but I think you can basically use it for any thing you want to carry around. I would say it is nice to carry a small craft project when you are on the go, for example, crochet, knitting, tatting, small hand-sew patchwork etc."